Eldership is a new attitude towards life and ageing. Arnold Mindell’s Process Work is a theoretical and practical frame for embracing hopes, fears and dreams as they revolve around ageing and living life itself. A Process Work mindset follows the joy principle: a sense that life’s complications – even those that we don’t want and didn’t ask for – present opportunities to learn and grow. Rather than feeling burdened, being critical, feeling down about your ageing and complex life, you can begin to welcome and appreciate it, look forward to the process of maturation, have the ability to counter your own ageism: anxieties and criticisms that put you down for growing old and older. A Process Work perspective views everything as interconnected – personal health and body symptoms, relationships, conflicts, community building and world events are all intertwined. 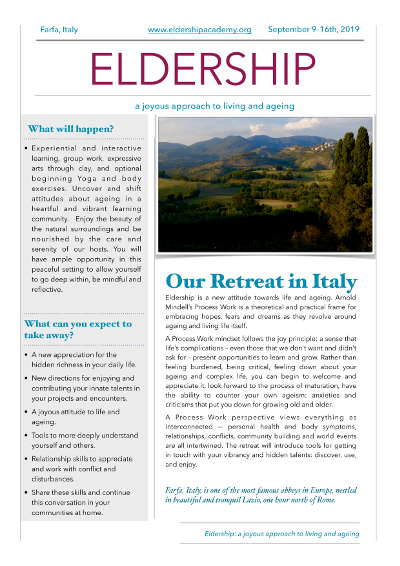 The retreat will introduce tools for getting in touch with your vibrancy and hidden talents: discover, use, and enjoy. We use the term eldership for an almost indescribable attitude of natural curiosity, vitality, and an overall helpfulness in a given situation. Eldership is not a fixed state, but a momentary experience, accessible to anyone. Role models, such as Nelson Mandela inspire a vision of eldership, in shining a light on the profound gifts and strengths of others. Such giants remind us of the innate characteristics that anyone of us can develop and use in our own lives, families and communities. At times, life itself seems to push us to the brink, even against our rational will, to discover moments of eldership through the many ups and downs we experience through life. What will happen in the retreat? Experiential and interactive learning, group work, yoga exercises[optional-no experience necessary], and expressive arts using Clay Work. Uncover and shift beliefs and attitudes about ageing in a heartful and vibrant learning community. Enjoy the beauty of the natural surroundings and be nourished by the care and serenity of our hosts. Each day Nader and Julia will offer a short thematic presentation on aspects of facilitation and eldership. As an entire group we will practice facilitation skills using topics of interest to participants. Behind interactions are different levels of experience – the ability to stay grounded in everyday reality and analysis; the emotional bandwidth to embrace tension and complications; and a detachment to allow an impossible situation to move forward, with all the inherent ups and downs. Our group process method invites creative exchange that allows these different levels as well as many sides and aspects of a situation to become visible in fresh and frank exchange, and make space for spontaneous insights and creative solutions to arise. Topics and questions of participants will set the tone for our process. 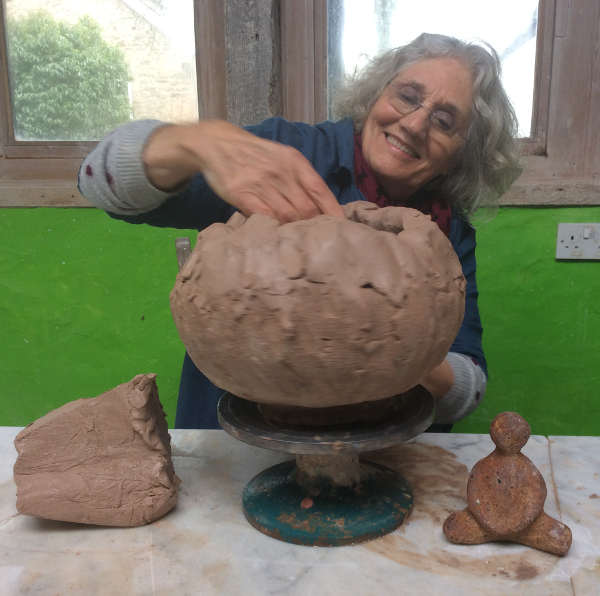 Madeleine, artist and potter, will guide participants in experimenting with clay, inviting play and spontaneity, while integrating ideas and experiences creatively. Through the medium of Clay emotions and feelings can be expressed creatively where it can be hard to reach with the use of words. 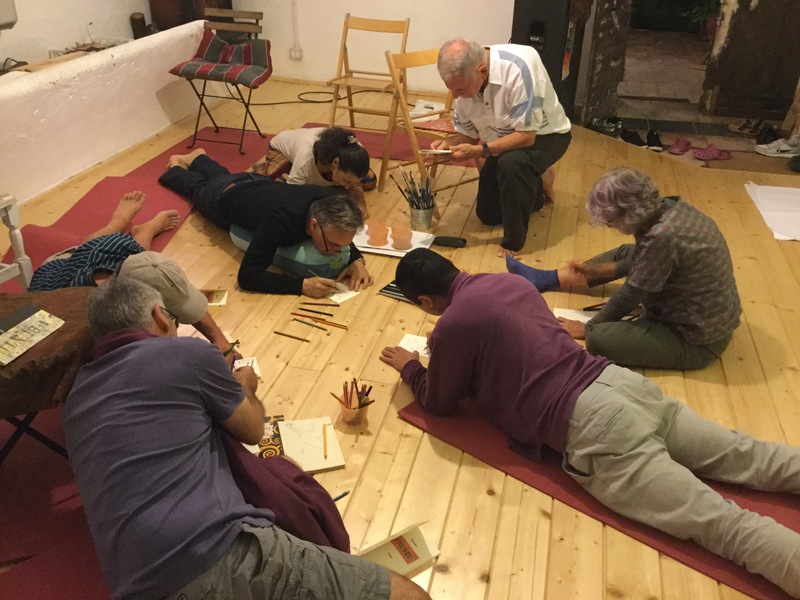 Art, yoga, poetry, literature, and story-telling, small groups and inner work are other refreshing ways we may use depending on the moment, to share what matters, and get to know as yet undiscovered aspects of ourselves, and who we are becoming. Farfa provides an opportunity for deep personal reflection contributing to changing, adapting, and reinforcing our world view around aging or eldership – the serene setting allows us to go deep within ourselves to be mindful and reflective. The rhythm of the day includes time to rest, to go for walks, to enjoy the local village, to enjoy good company, and the nourishing meals prepared by the nuns at Farfa Abbey. • A new appreciation for the hidden richness in your daily life. • New directions for enjoying and contributing your innate talents in your projects and encounters. • Relationship skills to appreciate and work with conflict and disturbances. • A joyous attitude to life and ageing. • Tools to more deeply understand yourself and others. • Share these skills and continue this conversation in your communities at home. • Anyone dealing personally with the process of ageing and other life transitions. • People coming together to share and hone their skills in eldership. • People of any age desiring a life of meaning with an eldership-informed awareness. • Students of Process Work and awareness seekers of all ages. • Providers and professionals engaging in fields of care and human services. • Those who are touched by the mysteries within everyday life. This workshop is open to awareness seekers eager to embrace the richness, impossible complications and beauty of life in the good company of others. Overall we are inspired to offer this retreat experience to encourage an eldership attitude in each person to blossom. Sometimes this may have an inward flavour. At other times, new directions may pull us to action. And for some, eldership might be moments of enjoy dancing with the ups and downs as they come. If you are eager to embrace the richness & contradictions of life and you want to develop eldership qualities and tools for yourself and your community, this retreat is for you! Attendance at any previous retreats is not necessary. Questions? Email Nader at nader@eldershipacademy.org. We have put together an online form for your convenience! Join us in Farfa, a medieval Italian village, close to Rome. The Abbey is in the heart of the Sabine hills, a place full of peace, serenity and simplicity. Residential Cost: The fee includes full board & lodging, programme materials & tuition beginning with dinner September 9th until lunch September 16th, 2019. Days of Process Work in an supportive environment of serenity. We will use in clay work, art, yoga, poetry, literature, and story-telling. We will engage with each other in small groups and use inner work to encourage an eldership attitude in each person to blossom. 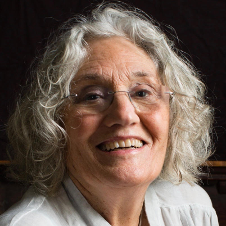 Julia Wolfson, Ph.D., PW Dipl. 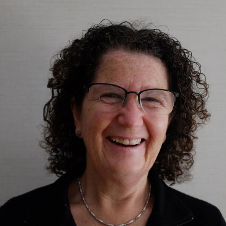 Julia is a Process Work facilitator and coach from Australia. Julia works internationally in the field of health, social care and human services. Her interest lies in assisting people reliant on support, their teams and organizational leaders to develop innate powers in pursuing a person-centered quality of life. Julia is a faculty member with the global DeepDemocracy Institute. Nader Shabahangi, Ph.D., PW Dipl. Nader is a Process Work facilitator from California. As a business entrepreneur and writer he enjoys creating projects for communal living focused on a person-centered model of care. He builds elder communities in the San Francisco Bay Area and is the author of books on re-visioning aging and a Process Work view of forgetfulness(dementia). 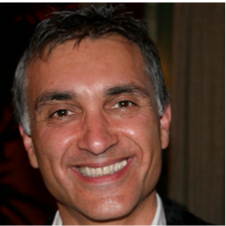 Nader is a faculty member with the global Deep Democracy Institute. Thank you in particular to our teachers Drs Amy and Arny Mindell and Drs Ellen and Max Schupbach, who have introduced us to the pioneering Processwork paradigm and continue to guide our learning path.